Bleed is a printing term that refers to a design that has ink printed all the way to the edge of the finished page. 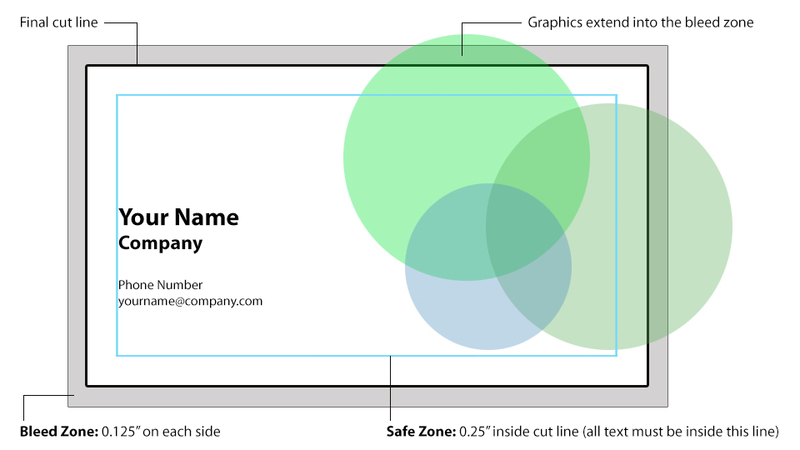 In order to properly print a design that bleeds, the image in the graphic file must extend past the edge of the paper. The image is then printed on an oversized sheet of paper, and after printing the page is trimmed down to the proper size. Traditionally, the amount of bleed added to an image should be 1/8″ (.125″) on each edge that bleeds. As an example, an 8.5″ x 11″ brochure with a full bleed (a bleed on all 4 sides) should have the design extend 1/8″ of an inch (.125″) past each edge of the page, for a total image area of 8.75″ x 11.25″. Making bleed for a solid color is easy, just extend the edge of the color box 1/8″ past the edge of the page. For graphics or photographs, one must be sure there is enough content to extend the image past the edge of the page sufficiently and allow for a bit of flexibility in the position of the final trim cut. Additionally, any type, graphics, or borders that aren’t to be trimmed (non-bleeding) should remain 1/8″ inside the edge of the page to allow for flexibility in trimming the page. Trim marks should indicate where the final page is to be trimmed, should be .25 to .5 pt in width, and start at least 1/8″ past the edge of the sheet. For most documents, it is sufficient to define the document size to the paper (final trim size), draw bleeding objects past the edge of the page, set bleed for the document specs, and allow the application to add the bleed and trim marks in the proper location during printing. For special situations, such as documents created in applications that don’t define a page size (e.g. Photoshop) it will be necessary to extend the graphic area and draw trim marks yourself. When creating PDFs, be aware that by default PDFs are created and displayed cropped down to the trim size. Be sure to include bleed and trim marks when generating PDFs for designs that bleed, or else carefully enlarge your document page size and draw accurate trim marks before exporting.